The thermoelectric effect of heated conductors was discovered by a German physicist Thomas Johann Seebeck in 1821. His discovery of any conductor with a thermal gradient would generate a voltage lead to the development of accurate temperature measurement with two dissimilar metal wires now commonly called thermocouples. Thermocouples are made by connecting two dissimilar metal wires together at one end. The open end of the wires will have a potential difference between them if the open ends and the connected ends are at different temperatures. If the open ends of the wires are held at a constant temperature, the voltage measured between them is proportional to the temperature difference between the open ends and the connected ends. With this arrangement, temperatures can be measured because the voltage created is consistently repeated versus temperature differences if the open ends are held at a reference temperature. The open ends are connected to terminals referred to as the “cold junction terminals”. In earlier times, zero degrees centigrade was the reference, but modern technology made reference temperatures easier to create. Electronic temperature measurements with thermistors, diodes, and other small electronic devices allowed the temperature of the cold junction terminals to be measured. The voltage the thermocouple creates at this temperature is added to the voltage measured at the cold junction terminals. The results make the signal level the same it would be if the cold junction terminals were at zero degrees centigrade. Zero degrees centigrade is the cold junction reference for the common voltage charts for thermocouples. 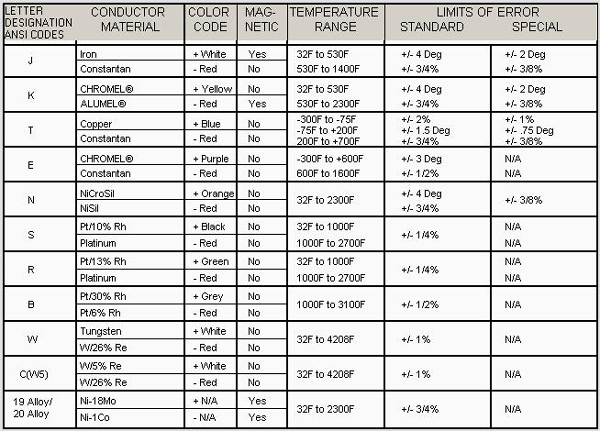 The National Institute of Standards and Technology (NIST), a division of the U. S. Department of Commerce, has created voltage charts for common thermocouples. Copies of these charts are available free from most thermocouple manufacturers and can be downloaded as PDF files from the internet. The J thermocouple is made of an iron wire (+ positive lead colored white) and a copper-nickel (Constantan) alloy wire (- negative lead colored red). It has a sensitivity of approximately 50 microvolts / deg C and an overall temperature range of -210C to 1200C, but is normally limited to narrower ranges. It has a limited range of -40C to 750C due to the Curie point of the iron at 770C. The iron undergoes a molecular change and permanently loses its standard voltage output versus temperature. It does not recover when the iron is cooled. The J thermocouple is one of the lowest cost thermocouples. The linearity of the J thermocouple varies by -70 degrees C over it full range from -210C to 1200C. It has a very straight section from 100C to 500C which deviates about -0.5C. The lower and higher ranges can be extended with a loss in linearity. Modern microprocessor based signal conditioners remove linearity problems by measuring the input voltage and using this value to check a memory chip to see what temperature it represents. It then creates the correct voltage via a digital to analog converter to make the output linear. It also does the same process if it is sending serial digital data instead of an analog signal. 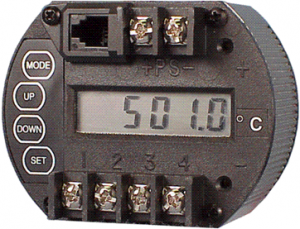 With a digital signal conditioner, the use of the J Thermocouple becomes limited by the environment and temperature range required. A typical digital 2 wire transmitter has a membrane keyboard for setup. An LCD display is required so the setup process can be observed. This transmitter will process signals from J,K,R,S,T,E,N thermocouples as well as .00385 and .00392 alpha platinum RTD’s. Linearization is accomplished with 256 point lookup tables stored in chip memory. Linearity is important only if the absolute temperature measurement is needed over a large temperature spread. If one temperature is required for process control, repeatability of a given temperature is important, but linearity is not required.